Party like a Las Vegas VIP on this all-night party tour. Ride from one hot spot to the next on a party bus equipped with an open bar, enjoy instant club access, with no lines and no cover charges. Craving a true taste of Sin City’s exciting late night party scene? This is it. Prepare yourself for an evening of non-stop partying at some of Las Vegas' hottest bars and nightclubs. 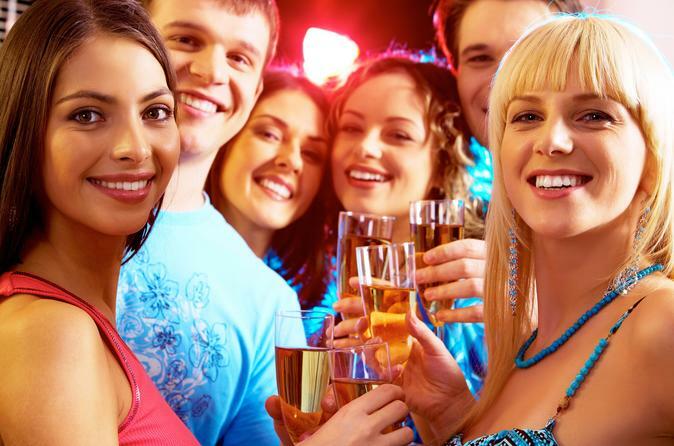 Your night will kick off outside the first venue where you’ll meet up with your fellow party goers. Your host will will be there, ready to whisk you straight past the velvet ropes. Once in the club, the VIP treatment continues and you’ll enjoy free drinks and drink specials. You’ll have an incredible time, as the fun-loving tour host is dedicated to keeping the party rockin’. Next, you’ll climb aboard your party bus, complete with a booming sound system, plush seating and stripper poles for drinks from the open bar while you travel to the next venue. For the rest of the evening, you’ll explore the best of the Vegas club scene, kicking it at four or five of the freshest party spots in the city. Depending upon the night, you might visit celebrity magnets like Body English, Hyde and Tao Nightclub. Or, you could end up catching David Guetta, Avicii, Deadmau5, Skrillex or another top DJ or performer at clubs like Drai’s and Light. Rest assured, every stop on the club crawl is a Sin City must-see. Please note: minimum age is 21 years. Government photo ID is required for all guests. Proper club attire is required. Refunds will not be issued if you choose to leave the tour early.